Writing for the Strib, Rohan Preston called Gem of the Ocean "coruscating." I had to look it up. The word means "to gleam with intermittent flashes: glitter, sparkle." It fits this production of the first play in August Wilson's Century Cycle—not the first he wrote, but the first chronologically in his series of ten plays, one for each decade of the 20th century. There is one scene in particular, during which Ester leads Citizen and the other characters to the City of Bones, built from the bodies of slaves who died during the Middle Passage, where the action and the lighting would not have worked in a smaller space. During this wrenching and powerful scene, a woman seated in front of us quietly sobbed. Austene Van plays the role of Black Mary, Aunt Ester's assistant. I'm convinced Van is really triplets, or at least twins; she's also director of two more shows still playing in St. Paul, Blues in the Night and Lady Day at Emerson's Bar & Grill, and she's understudy for Aunt Ester. It's what we do as actors. We usually take on a few things, and I can kind of sum it up like this: "Being a woman is hard work. Not without joy or even ecstasy, but relentless, unending work." Maya Angelou said that. Yeah, I'm tired, and yeah, this is not easy, but I love it, I love going to work, and I budget my time and try to take care of myself and focus. You make time for what you love. People seek me out to direct them or be in them or choreograph them.... I'm in half and half, half straight plays, half musical, but I always find rhythm. I'm always in something that has rhythm. Culturally, everything we do stems out of some kind of rhythm, how we walk and talk, how we communicate. It's jazz. We try to be mindful about being spot-on with our words. Change one word and the rhythm is off. I read the play before I saw it (truthfully, I finished the final act during intermission). That and talking with Van made me more conscious of the rhythm of the words. 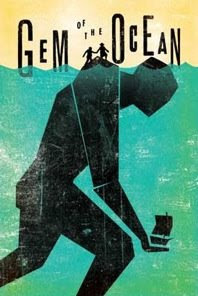 Coincidence: My friend Jennifer Nelson, who led the African Continuum Theatre Company in Washington, DC for many years, is currently directing Gem of the Ocean at Everyman Theater in Baltimore. Read about it in the Baltimore Sun.